An earlier Iranian satellite launch with the Simorgh. 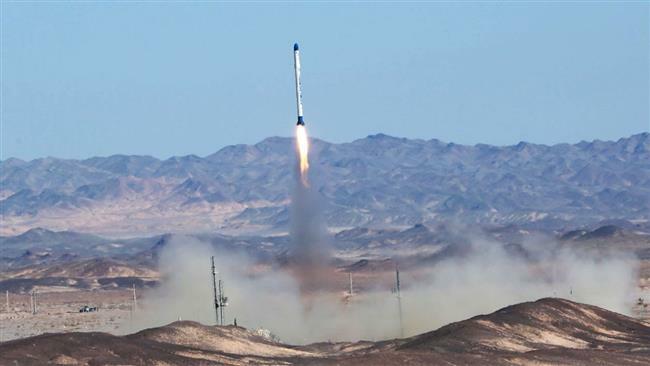 Iran test-fired an advanced rocket system in the Dasht-e Kavir desert last week, according to Russian and American officials, in what some considered a cover for intercontinental ballistic missile research. The Simorgh, as the rocket is known, is ostensibly designed to launch satellites into orbit. However, the technology involved is “practically identical” to intercontinental ballistic missiles, or ICBMs, and could be used to launch a nuclear device at targets thousands of miles away, according to Amir Toumaj, a research analyst at the Washington-based Foundation for Defense of Democracies think tank. The rocket launch was initially detected by two separate Russian radar stations at 9:33 a.m. GMT on April 19, Russian media reported, and it was later confirmed by US sources who first disclosed the test fire to the Washington Free Beacon. Under the Iran nuclear deal, which was signed last year, ballistic missile tests are not outright forbidden, but they are “not consistent” with a United Nations Security Council resolution from July 2015, US State Department spokesperson John Kirby said. According to the UN decision, “Iran is called upon not to undertake any activity related to ballistic missiles designed to be capable of delivering nuclear weapons, including launches using such ballistic missile technology” until October 2023. That has not stopped Iran from carrying out four tests of ballistic missile technology, including this most recent one, since the nuclear deal was adopted on October 18, 2015. It was not immediately clear if the launch was a success, in large part because the exact purpose of the test was not known. The rocket did not exit earth’s atmosphere, which prompted some US officials to tell Fox News that Iran had not achieved its goal. However, if the intent of the launch was not to put a satellite into orbit, but rather to test just the first stage of the rocket, last week’s test may indeed have fulfilled its mission, which was Toumaj’s assessment of the launch. The day after the above appeared in Times of Israel the following report appeared in Iran’s Press TV. Although it doesn’t confirm claims that Iran is developing inter-continental ballistic missile technology, it certainly lends weight to them. According to Press TV, a senior Iranian diplomat claims that the Islamic Republic is now capable of producing intercontinental ballistic missiles. Whence this assurance? Could it be that, as the Times of Israel claims, the recent launch of a Simorgh rocket was in fact a test launch of an intercontinental missile? Adding weight to those suspicions are claims by North Korea that it had successfully tested the engines for an intercontinental missile recently. Iran and North Korea are known to have shared missile technology and know how in the past. Could the successful test have been conducted with input from Iranian experts? According to Tal Inbar, of Israel’s Fisher Institute for Air and Space Strategic Studies, Pyongyang has recently made significant progress in developing ballistic missile technology with help from Iran. Ed. A senior Iranian diplomat says the country’s scientific power has made it capable of producing inter-continental missiles, stressing that Iran’s military doctrine is based on defense. “Our country’s power is increasing, and today we have no restrictions in defense fields, as in our missile program, we have no technical limits anymore,” Hamid Baeidinejad said in remarks published on the Basirat website. Baeidinejad is the Iranian Foreign Ministry’s director general for political affairs and the Basirat website is affiliated to the Islamic Revolution Guards Corps (IRGC). “Today, our scientific power has provided us the opportunity to even produce intercontinental missiles,” he said. “Unlike the military policies of other countries in the region and major powers in the world, our military doctrine is not after an escalation of threats in the region or the world,” Baeidinejad said. The high-ranking diplomat further said that Iran’s enemies are “seeking to pit military elements of the country’s security against its economic elements” by making the country’s defense progress costly. Baeidinejad, who was addressing a gathering of IRGC experts, said the “unparalleled” experiences of the IRGC in various fields of security have made it distinct from other countries’ armed forces.